Wish you all a very very Happy Valentines Day to all you guys. Hope you are all happy and having a great time. I am not a Valentin's kind of girl but hello , we gotto take benefit of every opportunity to dress up , right !! So here is a cute girly outfit, perfect outfit for date. I love dresses and specially white dresses, they so elegant and pretty, so I feel they are perfect for your valentines day outfit. The dress from Trinkledeaks has been sitting in my wardrobe and thought it would be for Valentines Day. I wanted to play up the doll like girly vibe. I paired my dress with Forever 21 booties and a light lavender cardi that I got off super cheap also from Forever21. Can we just take a moment and talk about the cutwork cafe shoes, omg, aren't they the cutest thing ever. 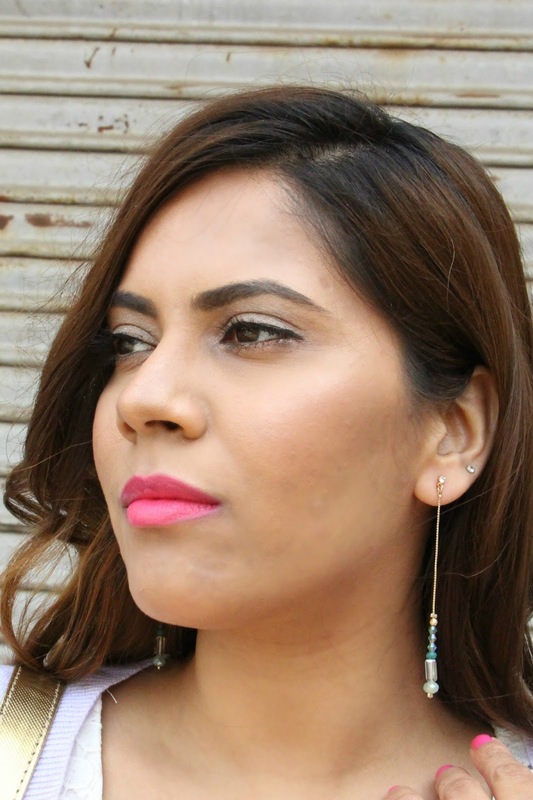 I wanted to keep the look clean so just wore these chain dangling earrings from Accessorize. I was invited to Select City Walk for a Valentines Event and this cute girly outfit us what I wore as a Valentines Day Outfit. It a cute girly outfit and apt for a date too. I feel this outfit brings out the inner beauty and simplicity. Do you like white dresses ! Very pretty dress and beautiful lacework! Lovethe dress...i so want to own it. Indeed a stylish dress and nice simple make up as well. Perfect outfit! Absolutely love it!